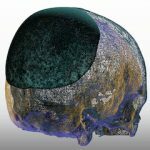 Custom skull implants are done for a very wide array of skull shape issues. They can be very large, almost covering the entire skull, to being quite small and discrete in surface area coverage. But regardless of their size, they all require a scalp incision to place them. The scalp incision may, on the surface, seem relatively minor. 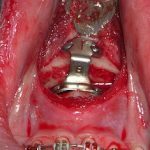 But in many skull reshaping patients that consideration may make the difference between having the surgery or not. This is because a significant number of these patients are men and many of these men have either closely cropped hair or shave their heads. Thus the appearance of the potential scar from the incision must be considered very carefully. One does not want to tradeoff one aesthetic problem for another. In looking at a fair number of scalp scars I am usually impressed with how well they do. This is an example of a smaller scalp incision done for the placement of a small custom skull implant and some skull reduction done behind it. In seeing the patient more than six months later the scalp scar was barely detectable. The key to getting a good scalp scar is how the scalp incision is made and closed. Protecting the hair follicles on the way in and out allows for optimal skin healing and limited scar formation. Since epithelial healing is partly aided by cells from the hair follicle, protecting their viability is important. 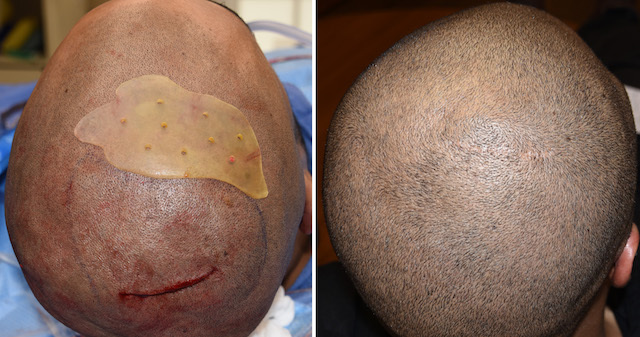 Avoiding thermal injury from electrocautery and strangulation from suture placement are key maneuvers to optimizing the final scalp scar appearance.